Mom with a Dandelion in Her Hair: Little Free Library - designed to look like a fairy house. 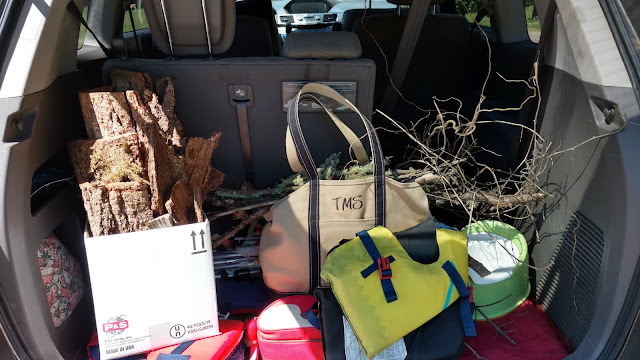 My two older boys are part of a Cub Scout Troop that needed a community service project. 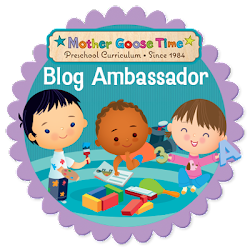 A little birdie told me that the Master Gardener in charge of the children's garden at Mt. Fir park was hoping to put in a Little Free Library. It seemed like a perfect fit. The first thing we did was have each boy draw a design. 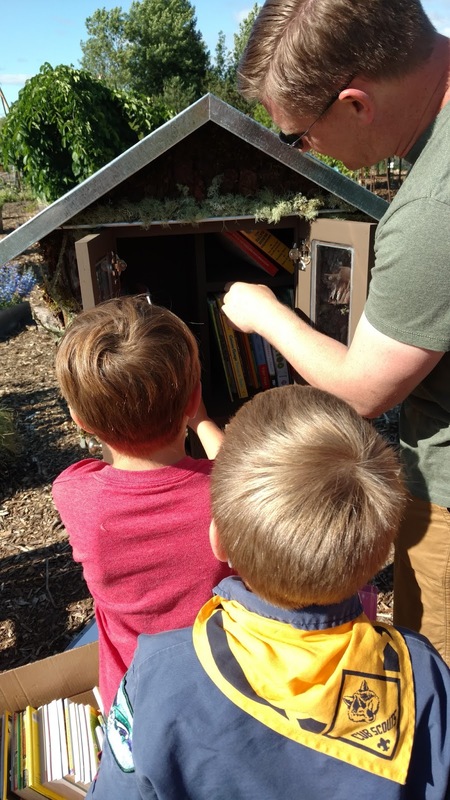 It was fun to see what their imaginations came up with and we have a binder with all their drawings stored in the Little Free Library for visitors to enjoy. The boys came up with dragon libraries, log houses and snakes that had conveyor belts and spit out books. 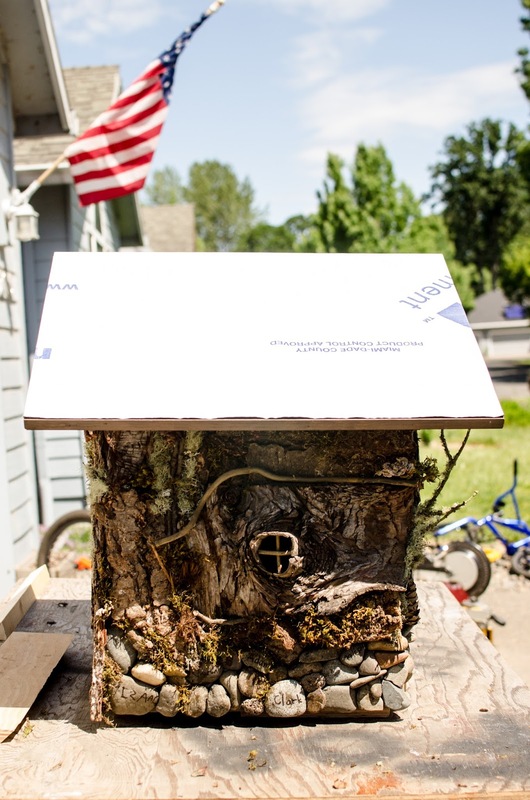 But we settled on making the Little Free Library to look like a fairy house because it will be located right next to the fairy garden that is part of the children's garden. My husband built the structure. He took measurements of all the children's books we own, well maybe not all, and came up with a size. Then he built it to be like a Home Depot project kit. It all slid together and could be hand screwed. Each of the boys took a turn diligently working to get their screw in tight. 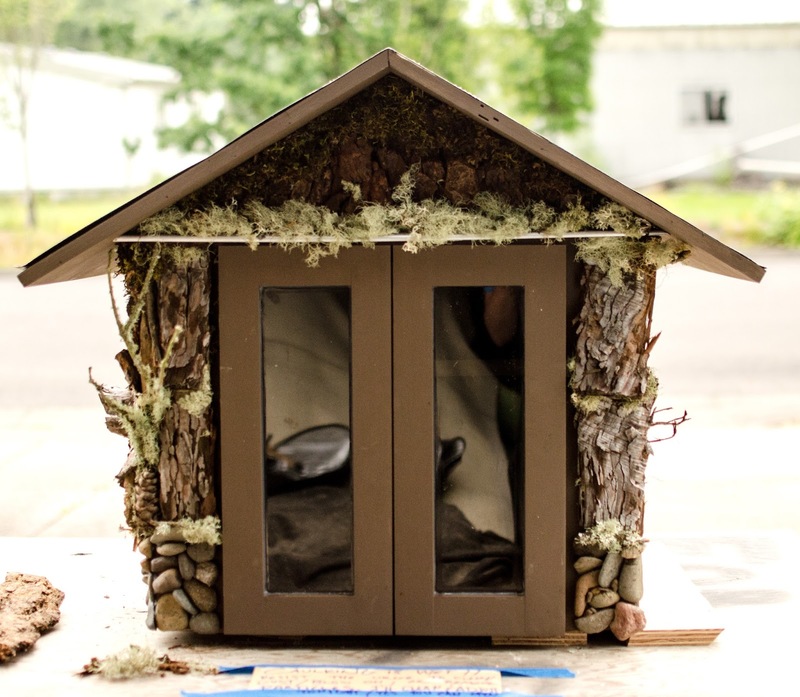 Now that we had a blank canvas, it was time to attach the rocks, bark, sticks, and moss. 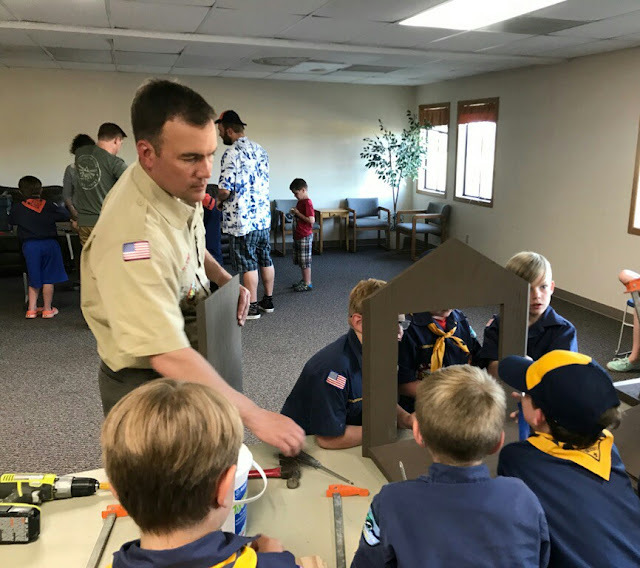 Since we had to use heavy duty glue and fit everything together like a puzzle, we weren't sure if this would be a good task for this age range of Cub Scouts. We did, however, have each Scout pick a rock and write their name on it with a permanent marker. These were then glued onto the Little Free Library. My boys and I went on a hike through my Aunts woods and got a lot more awesome stuff to decorate it with. 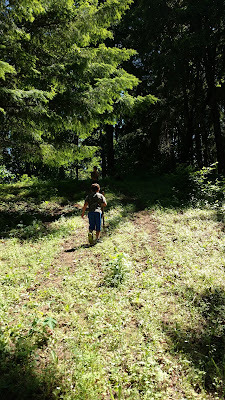 We had meant to have the Scouts collect all the material on their hike but on the day of the hike, there were thunderstorms and we had to reschedule. 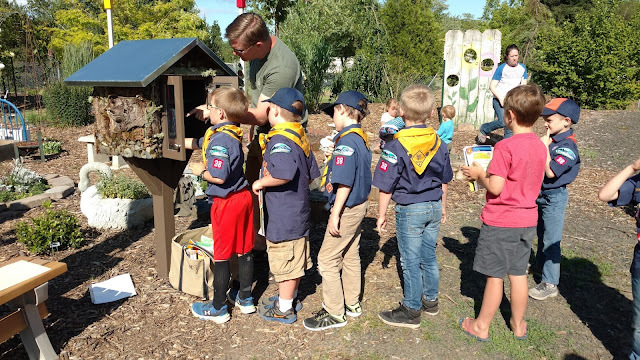 My only regret with the creation of this library is that we didn't find more ways to get the Cub Scouts involved, some of it was outside of our control and some of it was within our control but we were afraid of making a mess in the church that graciously hosts our meetings. If I had it to do over again I would find a new location for the meeting, have the boys wear painting clothes so they could get dirty with out having to worry. Never the less, it was now time to assemble and I recruited my Mother to help. I am so glad she was willing to help me, it would have been a really big challenge to do on my own. It took us 5 hours to complete the front, and the two sides (my husband did the backside for us). The most time was spent finding all the right rocks to fit together along the bottom. But it was worth it because I love having the boys names scattered around the bottom of the library. 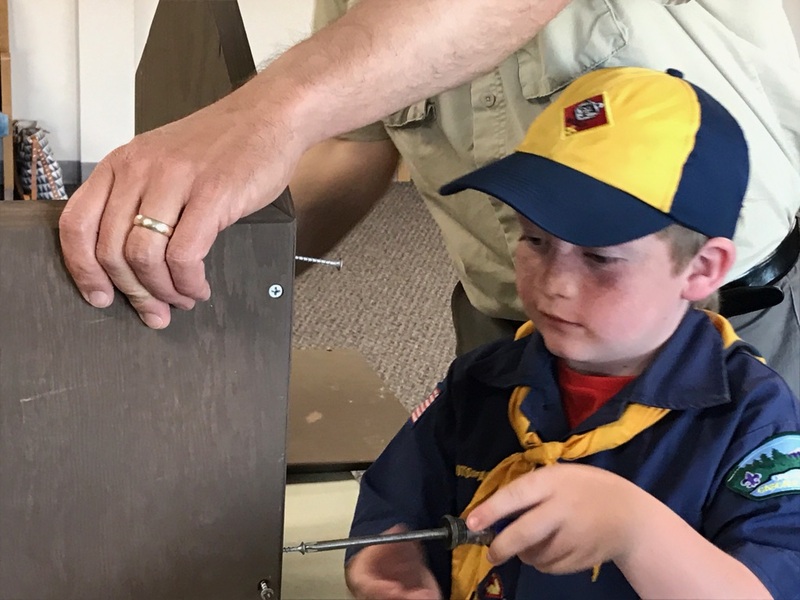 I do believe this part of the process could have been done by older Scouts, Webelos and up. Especially now that I have done it once and know the secret to making it look good, moss! Moss can be tucked into all the gaps and cracks and makes it all blend together perfectly, giving you more wiggle room. On the front we used river rock along the bottom, strips of bark up each side and above the flashing we layered bark chips that my Mom uses as ground cover in her garden. We stuffed the eves with a rich green moss and filled the space between the bark chips and flashing with light green wispy moss. We trimmed one edge with a really cool twig covered in moss. I am sure the twigs will get snapped off over time. But it looks cool for now. 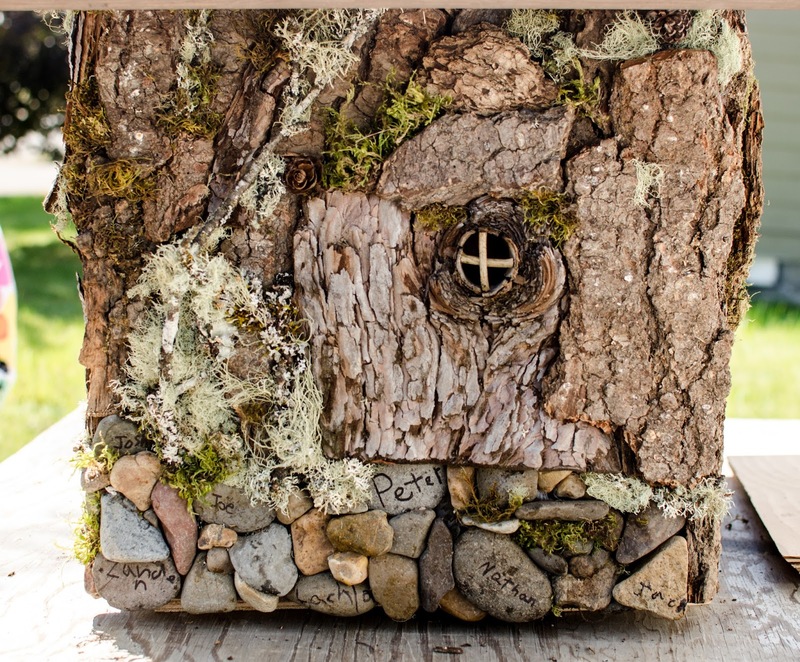 The sides were centered around two awesome pieces of bark that inspired the whole design, the pieces with the holes which make perfect fairy windows. As we started working on each side we worked from the bottom up. We laid the library on it's side and put the bark piece where we ultimately wanted it to be when the side was complete, then added rocks and built up to where the bark was sitting. 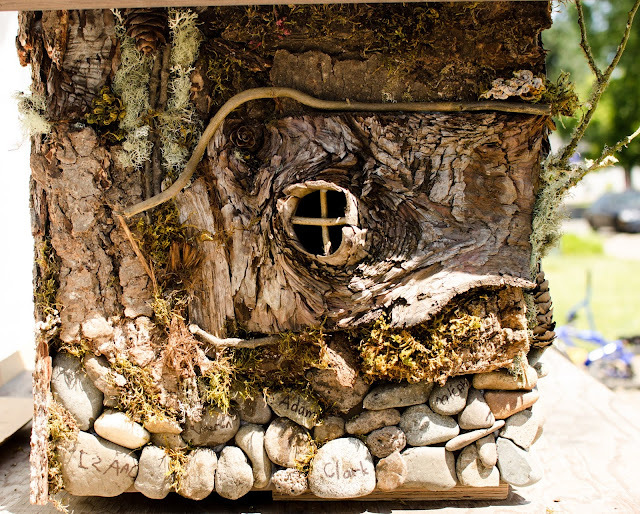 Once all the rocks were glued in place we would then glue down the large bark piece with the "fairy window". 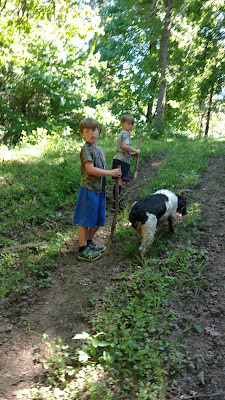 From there we would grab sticks, bark, pine cones and moss and puzzle piece it all together. Here is a close up. We discovered that if you pop the top portion of a pine cone off it gives you a great little rose bud looking accent. Here is the backside which my husband covered in bark. He actually took large pieces of bark and cut them into strips and laid them on there sort of like wood flooring. 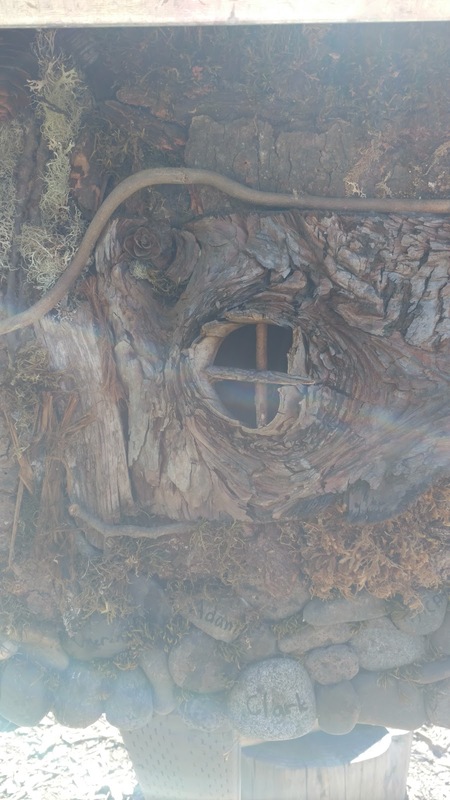 If the pieces of bark were wide they would have too much of a curve on the backside and they would not be easily glued down. Cut into strips they could be glued down well and because of how he installed them you can't see any cut edges. This is the other side with it's fairy window and the rest of the Scout names. Zoomed out to see all of it. When my husband got home he put the metal roof on and the little knobs on the front then we transported it carefully to the garden and got it installed. The night after we got it installed the Cub Scouts met us down at the garden and helped us put the finishing touches on the library by filling it with books. On June 2nd we held the official Ribbon Cutting Ceremony and invited the whole community. We had the children's librarian from the Independence library there and even the Mayor who helped officiate. The Cub Scouts started the night with the flag ceremony. Then Mayor John gave a wonderful speech thanking the Master Gardeners, the Cub Scouts and the parents for helping to make the community a better place by making this library. This is a video of the official ribbon cutting. Here it is a few months later, still standing, at the Children's Garden. We have already gone through a lot of books which is wonderful! 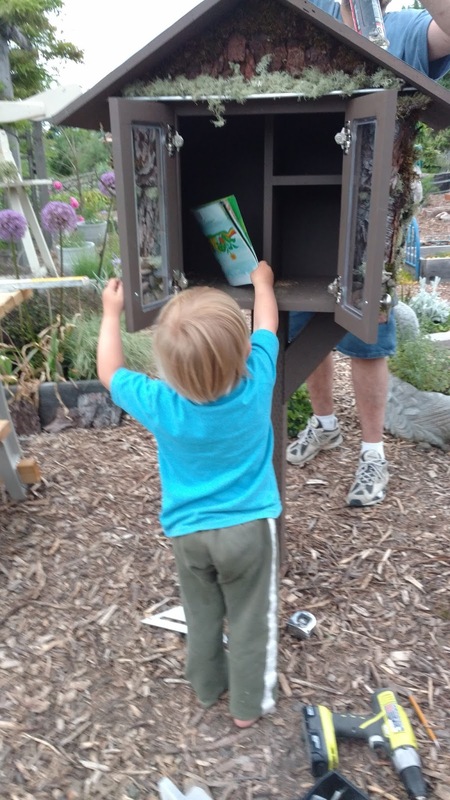 We are also officially on the Little Free Library registry. 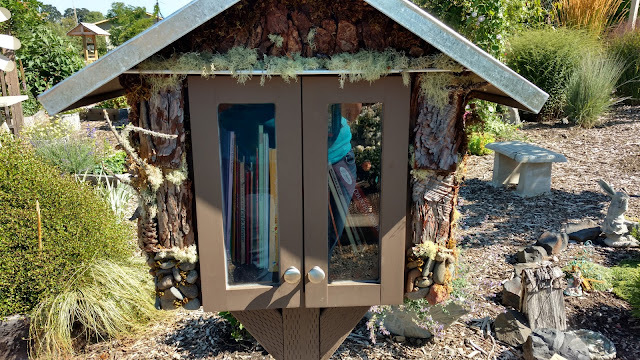 It was my husbands idea to make the roof out of durable metal, he really wanted this little library to hold up to the weather. I didn't think the metal roof would go well with the design of the library, however, now that I have seen it all together, I like the contrast. But the best part is, this garden and the library get watered daily. Even with daily watering it looks pretty much the same as the day it was installed. The only thing I have noticed so far is that the little sticks that make up the "fairy windows" keep getting pulled out. They really can't be glued in that firmly. Every time we are there I grab sticks from the ground, break them to fit, and put them back. Super easy. This has been our Little Free Library journey. It has been such a fun service project. We continue to get books donated to us and make trips routinely to put them in the library, together as a family. Typically, not all of the books make it into the Little Free Library because it's inevitable that each of my children will want to take one home. 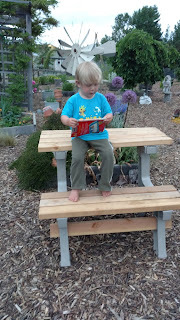 Books are more exciting when you get to pick them out from a little library in the middle of a garden! 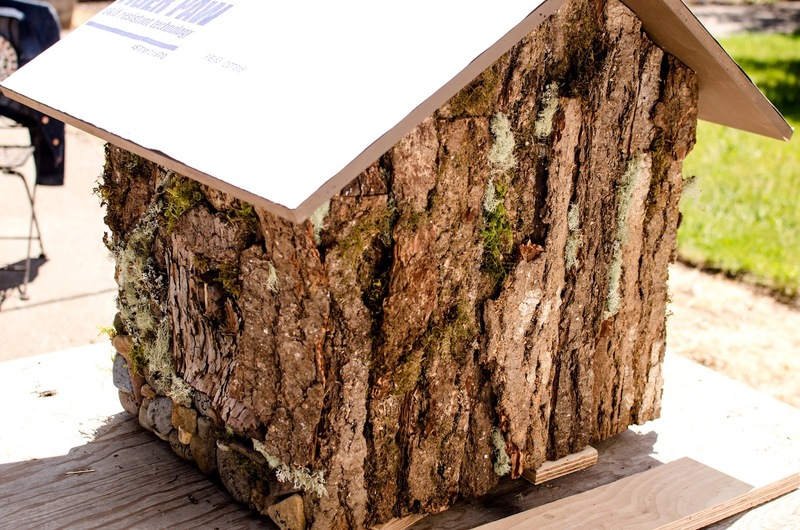 Construction Details: We used liquid nails (construction adhesive) to glue the bark on. This is a very strong glue but it is brown in color. It really is the best glue out of the two we used, but because it was brown it needed to be used where the glue really couldn't be seen. We used clear silicone to glue on the accents. Like the moss, pine cones, sticks and small pieces of wood because if a little glue oozed out, the glue couldn't really be seen. We also used this glue for the rocks and so far they have stayed in place. My husband was able to get AC sanded marine grade plywood from work to use for the house itself, but pressure treated plywood would be comparable to the wood he used. Thank you for this post and I go through almost all of these post. I like this fairy home hence thank you for this share. View at custom essay writing help page if you are interesting on online essay services. Beautiful! My library could use a makeover and this would be fitting as I live across the street from a wooded park lot. What did you use to adhere the rocks/bark and moss to the library exterior? I will have to dig out the tubes and take a picture of them and add that to the post. Maybe a how to build section at the end with the dimensions I promised. 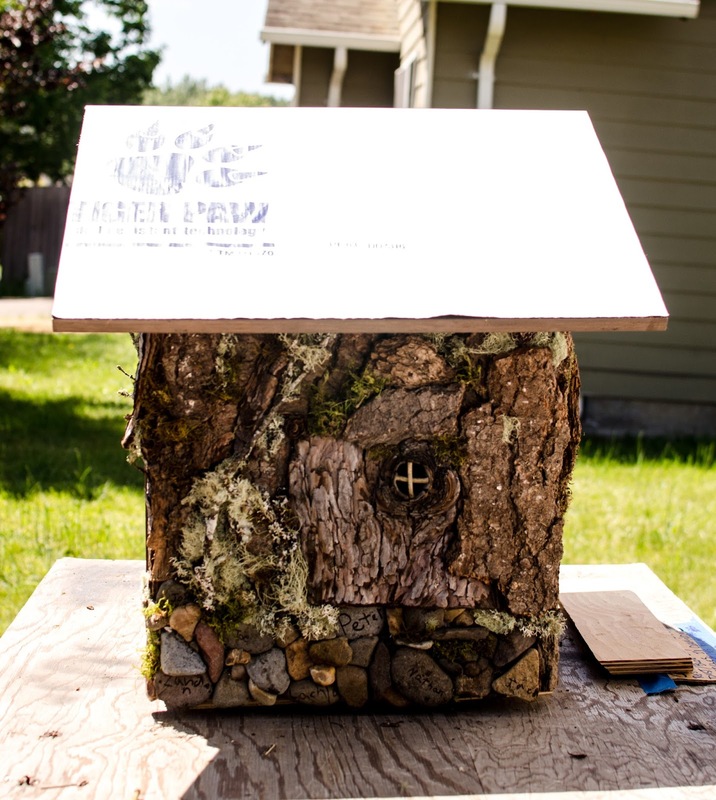 What a beautifully designed LFL project. Best of all, the Scouts contributed to making it, and hopefully help to maintain it with their own books. Great job! Yes, I love that part about this project. We keep getting books and I know some of the other Scout families keep getting them donated as well. We should be able to keep this library well stocked for years to come. Your library is so sweet and perfectly fits the environment! Thank you for being stewards and leading the scouts by example. They will remember this project for years to come. Wonderful project and story. Thanks for sharing!